MacDailyNews Take: Push as many new customers Apple’s way as your marketing budget will allow, Microsoft. Concerned consumers will gravitate even more to iPads, iPad minis, iPhones, and iPod touches, not to beleaguered Nokia’s phones or Microsoft’s GWAK tablets. After all, those toting around Windows Phones or Surface tablets make even Android settlers look like rocket scientists instead of unprincipled and/or clueless skinflints. 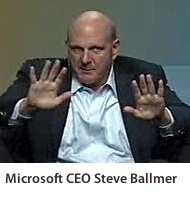 Hey, Ballmer: We like your strategy. We like it a lot. Good for Microsoft. At least they can do something right. Although I guess there stock isn’t in the toilet for the last six months. And Balmer, isn’t he a funny looking guy? I’d hate to see them get rid of him. Who’d give the crazy on stage presentations? I like to replay the one where he pulls a muscle as he’s bouncing around the stage yelling “I love this company”. It doesn’t get much better than that! How interesting is to see mafiasoft complaining about Google’s strategy for bundling products and sevices. Mafiasoft did and till does that, but as we can see, tasting their own poison seems not be so good! I don’t use any services or products from those two compaies! First rule of Marketing, one should not mention competitor by name or by association. That’s only a rule for the market leader. Microsoft is nowhere near that, so they can mention names. Pepsi can mention Coke. Coke ignores Pepsi. It is amazing to me that any business would allow their employees to acces the Internet through any Google product, and in the process invite Google to mine all manner of the companies internal data. Business use of Gmail, from which Google mines data, seriously? Not to mention Google Patent search, web search, maps, etc…..
MDN, why attack the enemy of Apple’s enemy? It’s nice to watch a fight between Microsloth and someone else for a change. Where’s the popcorn? Oh sh!t. I missed phase 1 and 2. WTF. I guess I need to start following some MS blogs to know what ‘marketing’ campaign MS is pushing because this is the first I’ve heard of screwgled. ” …a duplicitous company more interested in increasing profits and power than protecting people’s privacy and providing unbiased search results.” Isn’t Microsoft calling the kettle black? Run “LittleSnitch”(tm) and see how Microsoft tracks YOUR activities, mines YOUR data (assuming you use MS Office, etc.)! First, reporting back to Microsoft has NOT been in MS Office since the beginning. Pure, utter lie. I remember when the first version of Office shipped. (I may still have the hardbound PowerPoint user manual around!) AOL wasn’t even up and running on Apple’s internal network yet (yes, that’s where AOL started its life). Back then if you wanted ‘net access you went through either private services or dial up systems like GEnie or BIX. MS Office reporting back did not pickup until Office 2001 and didn’t really get going until Office v.X. Second, why have so many U.S. Government Agencies standardized on Office? It’s because those agencies gave their CTOs and IT Directors near absolute power to choose. Once this became known to Microsoft they pulled out all the stops to convince these people to go with MS products exclusively. There are many, many very well documented cases of how Microsoft spent tons of money to get these guys on their side. Just look of the case of the U.S. Navy’s decree several years ago (by the Navy CTO) that only Windows will be used as an OS unless the purchasing organization did one hell of a lot of justification (resulting in some ships being stranded in deep water when the entire network controlling everything from communications to propulsion went down and could not be rebooted) — all because Microsoft wined and dined and flew the Navy CTO to all kinds of exotic place for “product demonstrations”. The same can be said for NASA. One NASA official decreed that all Macs must be replaced with Windows based machines (even Macs less than a month old). This was after Microsoft wined and dined him and flew him to various places for “product demonstrations” and even featured him in several Microsoft produced videos. The U.S. DOE was not any better. In the early 90s Los Alamos was one the largest sites in the world for Mac usage. Then MS convinced the DOE that Windows was better and Macs quickly faded to the far also ran platform. The list goes on and on and on. Were these actions illegal? No. Were they unethical? Yes. A few of those CTOs and IT Directors lost their jobs once MS’s actions became public. However, all those Windows boxes stayed and all the Macs stayed gone. The agencies were not going to spend even more money putting the Macs back after the world found out how much they spent to get rid of them. None of these situations were based upon Microsoft reporting back information to the U.S. Government. None of them were base upon writing specific code into MS Office products so the U.S. Government can track what you put into your documents. Hell, that would have been an additional cost to Microsoft. Microsoft does not do anything that costs them more than the minimum. If MS Office is reporting everything to the NSA and other U.S. Government Agencies then post a few snippets of that code here to prove it. Either that or everyone should understand you’re just spouting crap.